Pam Williquette, the director of the Paynesville Area Community Service Center, called their March drive "very successful." "I feel very privileged to see how people gave from their hearts to meet two big needs (building and food)," she said. Last year, the center received about $17,000 during its March drive. This year, the center received nearly that much for food ($16,400) plus $25,126 towards a new building for the center. "Considering the community gave over $25,000 toward the building fund as well, I think being only a little under a thousand dollars short for food money is incredible," said Williquette. 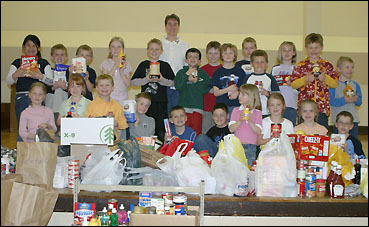 Mrs. Ahlstead's first grade class - shown posing Pam Williquette, the director of the Paynesville Area Community Service Center, and with some of the 1,569 pounds of food collected at the elementary school - was one of the top classes for collecting food for the March food drive at PAES. Instead of their current building, a renovated house, the center wants to construct a new 75' by 40' building at the corner of Railroad Street and Lake Avenue on the east end of downtown Paynesville. A new building would be more functional and handicap-accessible, according to Williquette. The Paynesville Area Community Service Center, according to Williquette, serves about 130 people (45 households) each month. It provides food, clothes, and household items to families and individuals in need in the Paynesville area, including Belgrade, Eden Valley, Hawick, Lake Henry, Richmond, and Roscoe. The food and other items the center provides do not come from her, Williquette told the elementary students recently. "It comes from all of you, and I want to thank you all for caring about the people who don't have as much as you," she said. The Paynesville Area Community Service Center is open to clients every Wednesday morning from 9 a.m. to 1 p.m., except on the fourth Wednesday of each month when it is open on Wednesday afternoon from 2 to 6 p.m. Appointments are also available for emergencies. The center, located on River Street on the west end of downtown Paynesville, also has regular drop-off days, for convenience and confidentiality, on Tuesday and Thursday mornings from 9 a.m. to 1 p.m.